‘Snapping César Vallejo’s Soul’: review of Malanga Chasing Vallejo: Selected Poems by César Vallejo, New Translations and Notes by Gerard Malanga (Three Rooms Press, New York, 2014), 257 pp. César Vallejo – as is well known – has influenced a bevy of Latin American poets (such as Nicanor Parra, Sebastián Salazar Bondy, Gonzalo Rojas, Ernesto Cardenal, Roberto Fernández Retamar and Juan Gelman), mystics (such as Thomas Merton), dramatists (such as Samuel Beckett, especially a crucial scene in En attendant Godot; see Efraín Kristal, ‘Introduction’, in César Vallejo: The Complete Poetry: A Bilingual Edition, ed. Clayton Eshleman [Berkeley, CA: University of California Press, 2007], pp. 1-20 [pp. 9-11]), musicians (such as Cesar Bolaños, especially his avant-garde piece, ‘Intensidad y altura’, of 1964), novelists such as the Chilean Roberto Bolaño (in his novel Monsieur Pain published in 1999, Eng. trans. 2010) and the Peruvian Eduardo González Viaña (in Vallejo en los infiernos, published in 2007, Eng. trans. 2015), and film directors such as the Swede Roy Andersson (in his film Songs from the Second Floor released in 2000), but to this list we must now add the photographer-poet Gerard Malanga (b. 1943), best known for his work as Andy Warhol’s right-hand man at The Factory in New York during the heyday years from 1963 to 1970. 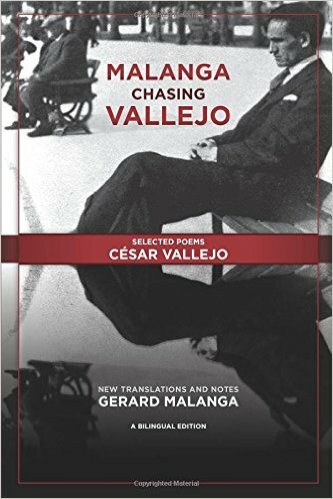 Malanga has published an intriguing book about his enduring interest in Vallejo’s work, Malanga Chasing Vallejo (2014), which includes 88 new translations of Vallejo’s poems. Malanga thereby becomes the latest in a long line of translators – including John Knoepfle, James Wright, Robert Bly, Clayton Eshleman, Alvaro Cardona-Hine, Jose Rubia Barcia, Ed Dorn, Gordon Brotherson, James Higgins, William Rowe, Richard Schaaf, Kathleen Ross, Rebecca Seiferle, Barry Fogden, Valentino Gianuzzi, Michael Smith, and Joseph Mulligan – who have grappled over the years with the Peruvian’s often impenetrable verbal artillery. The fascination with the Peruvian poet even led Malanga – in 1969 when The Factory was in full swing – to contact Vallejo’s widow, Georgette, who was living in Lima at the time, to ask her opinion of his translation drafts. Georgette’s evaluations of Malanga’s drafts are brusque, at times brutal. ‘One gets the impression you don't fully understand Spanish, coming to use verbs in the present tense which in the original text determine a a past tense' (p. 251), she says to Malanga in one of her missives. But Malanga was not deterred and he laboured on. At times he simply ignored Georgette’s advice; see, for example, Georgette's criticism of his translation of the verb 'solia' as if it were a present tense in 'Solia escribir con su dedo grande en el aire...' from Spain, Take This Cup From Me and compare with the final version of the translation (p. 225). A review which appeared in Publishers Weekly on 6 July 2015 suggests that Malanga ‘sometimes sticks to literal sense, but not always. His translations probably will not become the standard, but they are welcome anyway; the attention they bring to the Spanish can only do good’ (‘Malanga Chasing Vallejo’ , http://publishersweekly.com/978-0-9895125-7-2). Malanga, though -- like Clayton Eshleman -- is an acclaimed poet in his own right, and his translations of Vallejo's verse have a spontaneity and edginess about them which engages the reader, draws him in. The dogged way in which Malanga ‘chased’ Vallejo suggests that this was much more than a passing fad for Andy Warhol’s right-hand man. In a recent review Djelloul Marbrook points to the spiritual affinity between Andy Warhol’s photographer and the Peruvian poet: ‘There is something profoundly poignant in Malanga’s long pursuit of Vallejo’s significance. The more Malanga pursued Vallejo the more relevant Vallejo became to his pursuer’s time. Malanga is in some ways a quintessential insider. His photographs of the famously creative are iconic, in some ways more famous than their subjects. But in his later years, as if he had by hex slipped dimensions, he has come to stand outside looking in, remembering what it was like to be inside but holding himself to a passionate and hermetic project of alien observation’ (‘Review of Malanga Chasing Vallejo’, Galatea Resurrects ♯ 23 (A Poetry Engagement), 9 December 2014; see http://galatearesurrection23.blogspot.co.uk). We have a hint of what Djelloul Marbrook means by his allusion to Malanga’s ‘passionate and hermetic project of alien observation’ in some of the meta-portraits Malanga created during his work in The Factory. While he was photographing individuals – including Andy Warhol himself – involved in the Factory in the 1960s, is it possible that Gerard Malanga was simultaneously attempting to snap Vallejo’s soul?